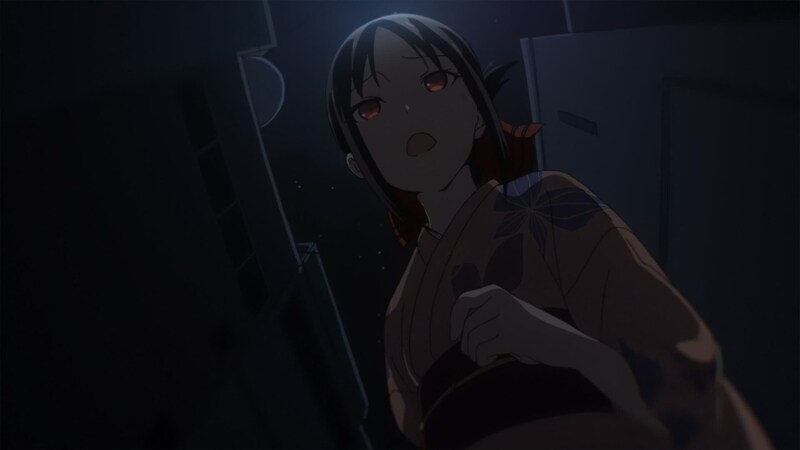 To the surprise of no one watching the series, Kaguya-sama: Love is War effortlessly landed its final arc. To understand why the show turned out to be such an easy recommendation to viewers who like romcom anime (and those who don’t too, most likely), let’s examine the last episodes of the show, which embody the staff’s dedication to the project, their exceptional understanding of the material, and the charm of the show altogether. Enjoy! 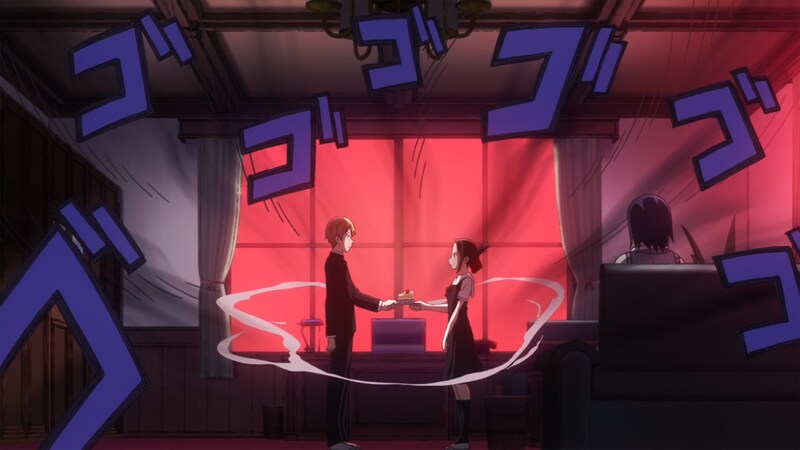 Our first writeup about Kaguya-sama: Love is War mostly revolved around its uncanny yet somehow perfect mix of emotional sincerity and, to put it bluntly, high-grade romcom nonsense – ingredients many people try to mix yet few succeed to, especially to this degree. 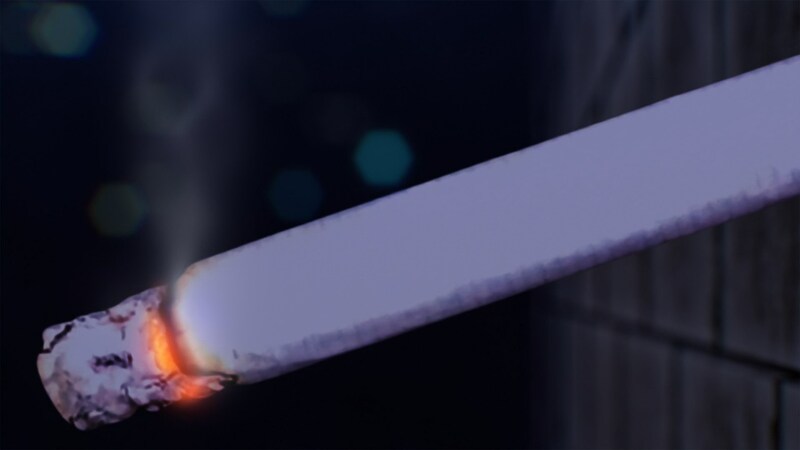 As we explained there, the already neat source material happened to land in exactly the right hands; series director Mamoru Hatakeyama has a well-defined aesthetic, an ethos supporting it, familiarity with the kind of ridiculousness Kaguya-sama skits devolve into, and the elegant delivery to sell the emotional core that actually sustains it all. A match made in heaven, essentially. And as we return to the show, we find… more of the same, in the best of ways. Episodes #06 and #07 were once again storyboarded by Hatakeyama himself, who ensured that the last introduction to the cast (for now) was just as seamless as the short sequences he threads together when the two leads are coming up with impossible plans. While the show maintained its identity very consistent during this middle stretch, that doesn’t mean no surprises awaited even the most avid watchers. 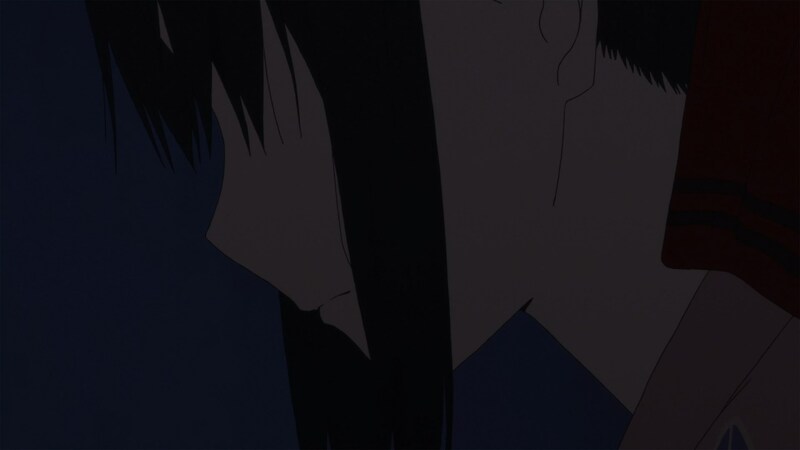 Sometimes it was a sequence as simple as Kaguya staring at her nails in episode #06; beautiful shading work and elegant character art, subjectivity achieved through the old trick of clouding a POV shot to hint at tears before we’re able to see them, all to capture her vulnerability at the moment. That same care put into emotional moments elevated many of the gags. Look no further than episode #07 and the skit where Shirogane nonsensically pushed his friend asking for romantic advice towards part-time working. His enthusiasm escalated with each iteration of the joke, until the entire world caught on fire with his cluelessness and passion for work – hilarious in and of itself, and even more so if you realize that animator Hayato “kusogif” Kakita was channeling the Yutaka Nakamura-style gratuitous approach to impact frames that many young animators (including his own friends) have embraced, to highlight the misguided intensity. And, due to the show’s effortless tonal duality, sometimes those flashes of excellence hit both ends of the seriousness scale within the same gag. 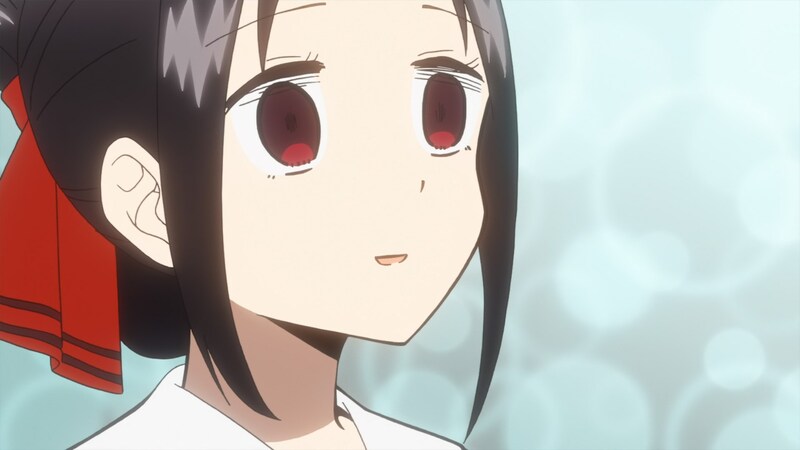 Takashi Torii‘s loose animation in episode #08 made the studying (citations needed) montage hilarious to everyone but Ishigami himself, before that same skit ended with an exceptional showcase of lens awareness to highlight that Kaguya truly cares about him. And that was just one episode after the show dedicated the most ornate storyboard of all, with some truly poignant shots, to a chapter about laughing at the idea of dicks. 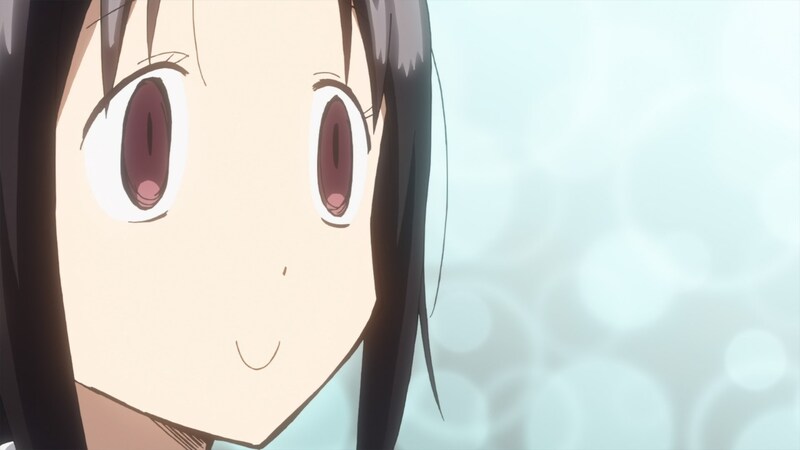 We keep repeating that Kaguya-sama takes the characters’ true feelings with the utmost respect, but it goes without saying that it puts just as much focus on their idiotic brains. In that regard, I want to highlight episode #10 as one of the best directed efforts in the entire show. And I do mean directed in particular, since it allowed me to finally notice episode director Tsuyoshi Tobita. Though he’s hardly a newcomer – his directorial career started about 10 years ago within Fairy Tail – I’ll be perfectly honest and say he’d never caught my eye before. Perhaps due to his collaborations with many talented series directors (including Hatekayama himself, as he already handled 6 episodes of Grancrest War) he seems to have recently hit a turning point in his career, so you might find some recent favorites if you check his resumee. 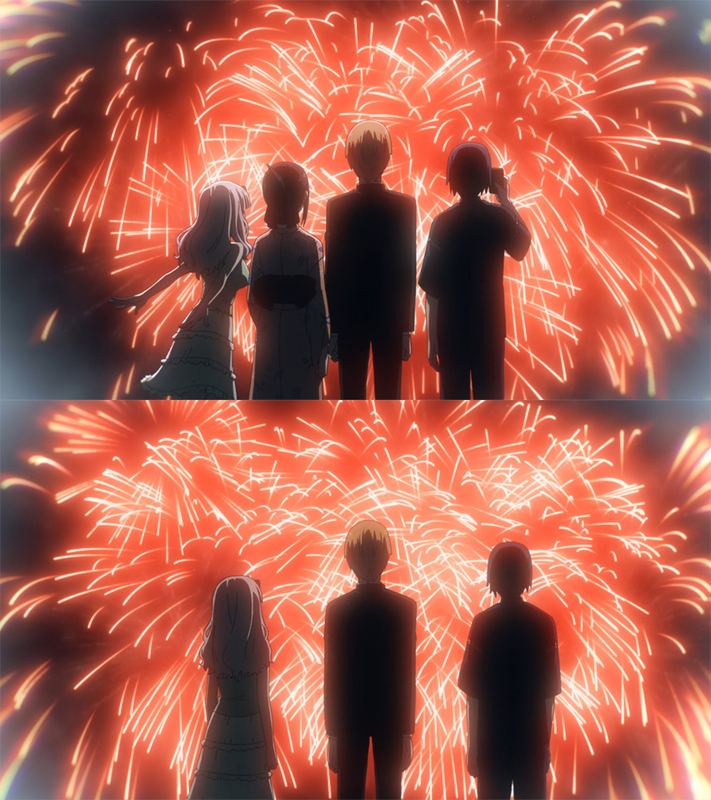 Even when it comes to Kaguya-sama, Tobita’d already coordinated the non-VFX part of the opening sequence and directed a couple of episodes before, but I’d carelessly chalked up all the good work there to the excellent storyboarders he collaborated with. As it turns out, I was underestimating his input. My personal turning point came after watching Mob Psycho II #07 (the climax of Reigen’s fantastic arc) and Kaguya-sama #10 within a few weeks of each other, forcing me to examine his work once more and realize why exceptional project leaders are beginning to trust him so much. His proficient usage of kagenashi shots to cleanly capture Kaguya’s emotions makes sense considering the extense experience under Hatakeyama that he’s quickly amassed, and there’s a lot of merit to having the funniest visual gags in such a laugh-out-loud series simply based off incredible still yet perfectly timed expressions and a few outrageous cuts. An inventive storyboard goes a long way to making an episode feel special, but to truly stick the landing you need someone capable supervising the production process that expands on all the ideas contained there, someone capable of giving input to each department to fill the gaps that always appear. And Tobita seems to be offering other creators that kind of reliability. As we move towards the end of the show, #11 might be the one episode I’d single out as a bit of a conservative effort; since most key staff had already moved onto the grand finale at that point, it was very much a case of let’s get this done, meaning the delivery wasn’t quite as energetic as the rest of the show. Don’t interpret that as the staff not caring, though – above everything else, it’s further proof of the smart allocation of their resources. Both Hatakeyama and the studio’s management crew got to assign episodes to creators who shine on that particular role (Oikawa’s episode #05 storyboard still being the most obvious example) while at the same time knowing when to hold back in the animation front. Had they not actually cared, we wouldn’t see Shinobu Nishioka officially tasked with supervising the animation of the four devas of ramen during a throwaway skit, just a few episodes after she’d worked as the animation director specifically for Chika’s dubious rapping. Which is to say that the staff were deeply invested in this worker even at its silliest, and that part of that smart resource management entailed hilarious staff bias for Chika. If you found it suspicious that she got an obscenely well animated dance performance and special staff dedicated to her, then you were in the right track. Is that a good thing? Absolutely. Moving on. 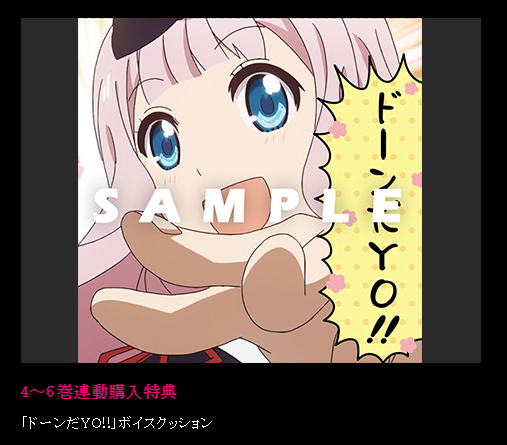 One of the exclusive extras if you buy Kaguya-sama’s disc release from Aniplex themselves is a cushion that makes terrible Chika rapping noises if you press it. That’s information you needed in your life. Though I said that #11 wasn’t quite as fancy of an episode as we’d grown used to, that’s not entirely true. 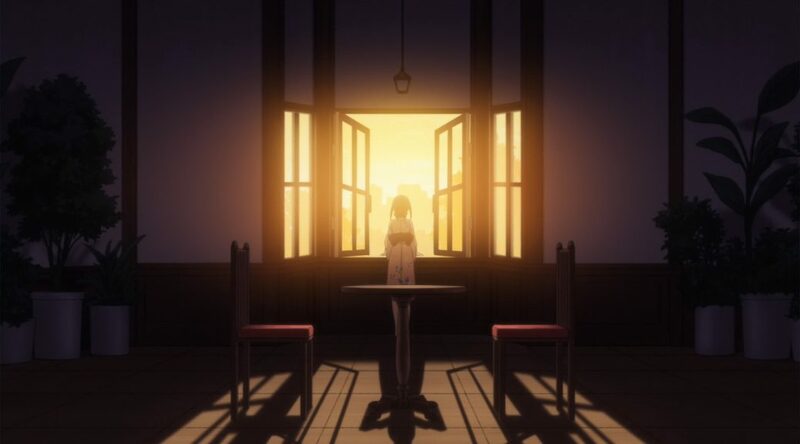 The post-ending sequence in that episode was technically made as part of the finale, and it offered some of Hatakeyama’s most inspired direction in the show as a whole despite not being credited for it. 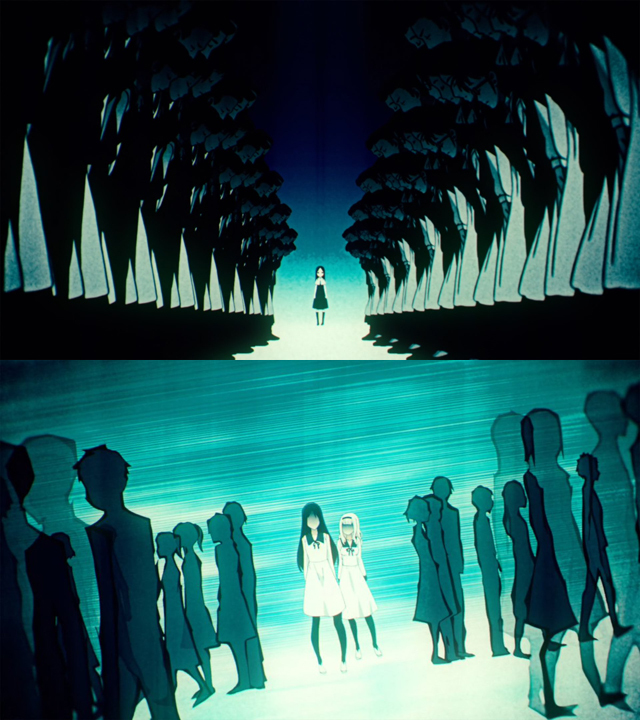 To be fair, though, his participation for that segment is obvious in retrospect because of the usage of imagery from #12 like the windows and the photorealistic, luscious hair – a symbol of Kaguya’s rich family and thus her current source of problems – plus visual quirks he’d exhibited in previous storyboards of his. 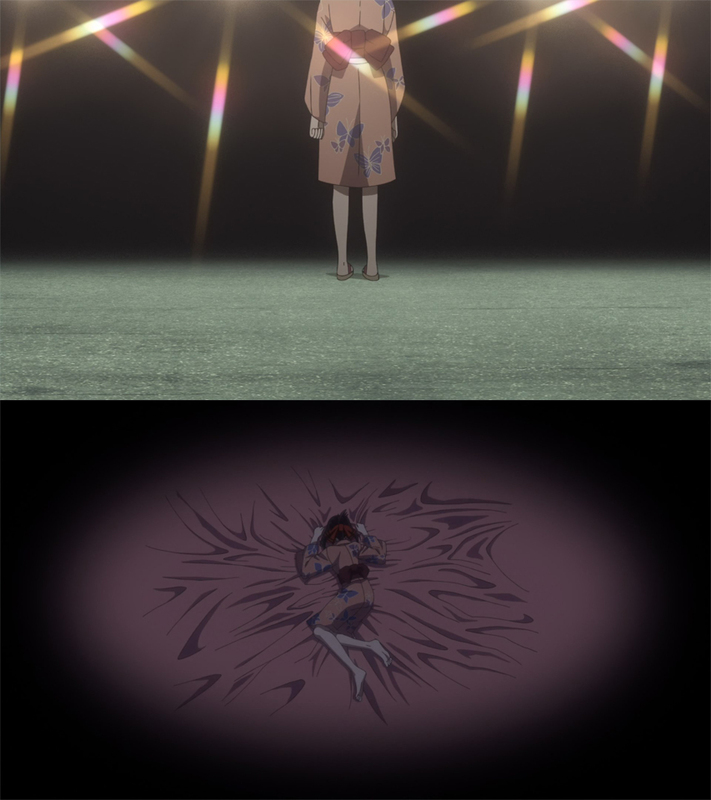 The final sequence summarizing the pressure and loneliness she’s always had to bear as the trophy child is as sleek as it gets, and yet quite distressing to watch within context. The last episode followed up on that upsettingly good prologue with a much more cheerful grand finale, which was a nice choice for everyone’s emotional wellbeing. Don’t get me wrong though: Hatakeyama got uncomfortably close to his characters at their most vulnerable, and his storyboard pulled back no punches when it came to depicting Kaguya’s isolation and how much their friends had come to care about her – for an excellent example of body language conveying that, look at everyone’s body language being more lifeless without her… including Shirogane’s fists, no longer clenched. Tremendously effective emotional storytelling and I never want to see it again! 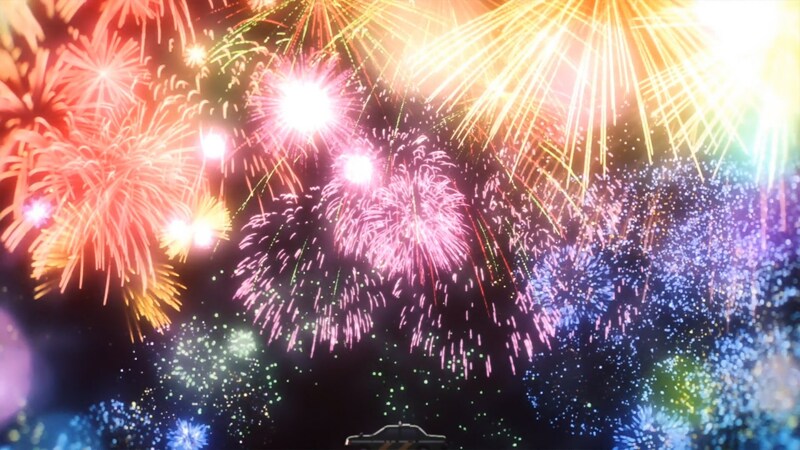 Fortunately, there were just as many thrilling sequences about their ridiculous rescue plan coming to fruition; shots like the Oishi-style low-angle run and the live action smoking must have felt amusingly familiar to SHAFT fans, but at the end of the day, the fireworks were the star. I think I’m beginning to understand why Kaguya loved them so much. The last comedy segment, rather than devaluing the precious moment they just had, served to wind off the accumulated tension and remind us that the more the things change, the more they stay the same. Of course, it helps that Hatakeyama’s a smart director who can thread together an overarching visual vocabulary within an episode that changes its tone so radically; all the shots with a lonely Kaguya looking out her window, longing for the freedom outside, are reversed at the end with an intimate shot between Shirogane and her, framed from the outside and reflecting clear skies. These two might be the single most stupid geniuses, but they’ll be fine together. We tend to wrap up our coverage of shows with a few paragraphs of final conclusions, including a look at the production as a whole and the aftertaste the series left on a more personal level. My apologies to those of you how had to read through the overly lengthy thesis about The Promised Neverland just a few days ago, that was a lot of conflicting elements to make sense out of. When it comes to Kaguya-sama, though, I feel like everything speaks for itself. 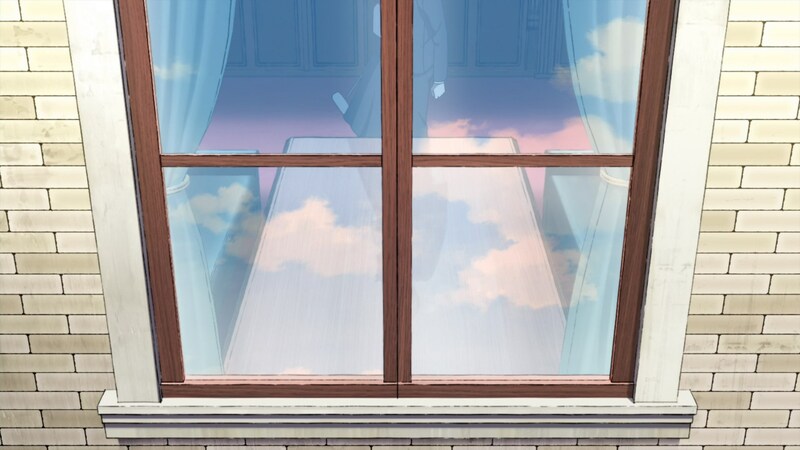 I understand why some fans feel the need to call the series a parody of romantic comedies since that’s a genre that a lot of people had come to frown upon, but as far as I’m concerned, Kaguya-sama is far too sincere for that; sure it does escalate the more ridiculous aspects of the will-they-won’t-they struggle, but it’s always respectful towards the feelings of the characters – though they might, and will, get owned – with no one crumbling into shallow caricatures. At its core, Kaguya-sama‘s just as romantic as its two dorky protagonists. And, regardless of your interpretation of authorial intent, that’s damn cute. All those qualities from the source material were amplified and tweaked to work as well as possible in animation form through one of the most deceitfully impressive adaptation efforts I’ve seen. Mamoru Hatakeyama and his team didn’t try to reinvent the wheel, but each minor change – rearrangement of the skits, transformation of small infodump panels into seamless little sequences, recurring imagery derived from the tone of the gag, countless musical cues that will make you smile whether you get the reference or not – is a very deliberate, thought-out attempt to make the TV series a worthwhile experience in its own right. While it’s easy to credit the source material when an adaptation nails it by sticking very close to the original events (and you should! ), the delivery is nothing short of masterful. And you know what? That’s not surprising at all! Or it shouldn’t be, at the very least, considering a point we’ve been hammering for a while: Hatakeyama was born to direct a show like this. His directional upbringing on wacky SHAFT romcoms and the solemn sense of staging he developed over time make him capable of tackling different registers, and Kaguya-sama happens to feature all of them coexisting gracefully. From the most outrageous mindgames to the asphyxiating opulence of the Shinomiya household, his directions and often first-hand involvement felt like exactly what the show needed at all points. His aesthetic of choice is memorable in and of itself, and he manages to sell it with such grace that you’d think it’s something he came up with for this project. At the end of the day though, it was his understanding of the work’s priorities that let it all work out so well; after such a fulfilling show, I shudder at the thought of a parallel world adaptation that sacrificed the genuine bonds at its core in favor of louder comedy. As for the rest of the production, there are no big surprises either. I feel like some people misunderstand the intent when we say projects like this are “low priority” – it’s not meant as backhanded praise, but rather appreciation of what the team’s managed without that many resources. To an even larger degree than Grancrest War, the team that gathered around Hatakeyama was fairly small and without all that many popular names, as the studio tends to allocate production resources to titles deemed more important. Now that’s a shame to some degree, but it hasn’t been able to get in the way of the staff’s ultimate success. You could say that fatigue taking a toll on the team to the point they had to rely on partial full overseas outsourcing (apologies for the oxymoron) for episodes #08&10-12 had a negative effect on the quality of the animation, but the fact that most people didn’t notice until I just typed it out stands as proof that it wasn’t a major problem. There’s no denying that things could have gone a bit better with a smoother production, and enough time for the most talented members of the team to put together stunning one-offs moments like Naoya Nakayama’s Chikatto Chika Chika, but I consider myself fully satisfied by what we got… save for the fact that I’d love to see a sequel to follow the meaningful advances in the central relationship in anime form, with a healthy side dish of the dumbest comedy known to man. 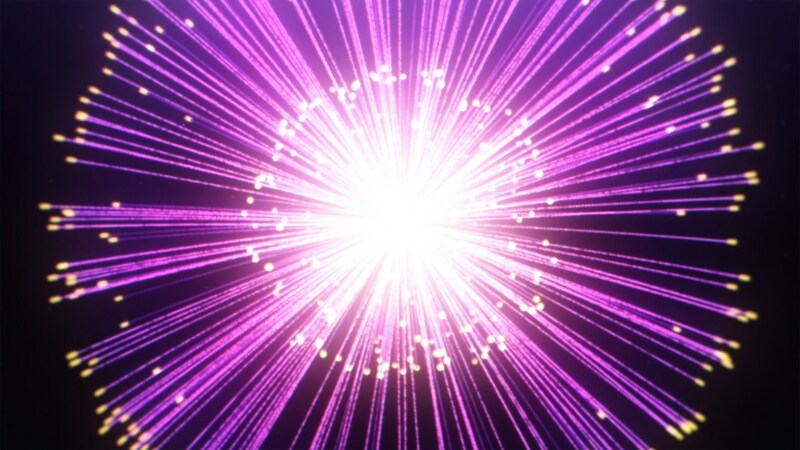 As much as I enjoy teasing people with information that isn’t really public yet, this time I genuinely have no idea whether that wish will be granted or not, so I’ll just go pray to whatever chaos deity sent Chika into this world. You’re welcome to join me in those prayers. Easily my AOTY. Thanks for writing wonderful posts and tweeting about it every week. I don’t always watch the anime this blog writes about but I love the opportunity to learn about how anime was really made. Lets pray for season 2. Well, Slime and Neverland have already received the announcement, so I would hardly be surprised if Kaguya also gets the second season. In the end, this is one of the most popular shows of the season, if not the most. I felt you would enjoy this show, lol. Well, this is exactly the type of comedies that I love so much – smart humor and a good visual that emphasizes it. Not to mention the fact that this show seems to be a funny parody of the whole romantic stuff in Japanese culture. “Dorks dunking on each other but ultimately enjoying being together” is one of my not-secret weaknesses, so it’s not surprising that I ended having a great time with the manga as well. Giving that material to a director with a profound understanding of it and the stylistic flair to make this show stand out in a season with an immediate classic like Mob Goddamn Psycho couldn’t go wrong. And it didn’t! Now I really understand how important it is to feel the soul and atmosphere of the original sourse, and not just to make a good adaptation. Also thanks for the Mob Psycho. A couple of your articles / tweets + conversation with my friends who already watched this show, and I decided to watch at least the first season. When is the new season of kaguya – sama is being released any idea please?